Arco-Íris (Leiria, Portugal) on 17 March 2008 in People & Portrait and Portfolio. In S. Pedro de Moel, 2007. A super composition! I like the different textures and colors. An excellent image. Lovely the effect of the silhouette on the three leveled background! Alone facing the sea... face to face with oneself... a quiet and peaceful moment. 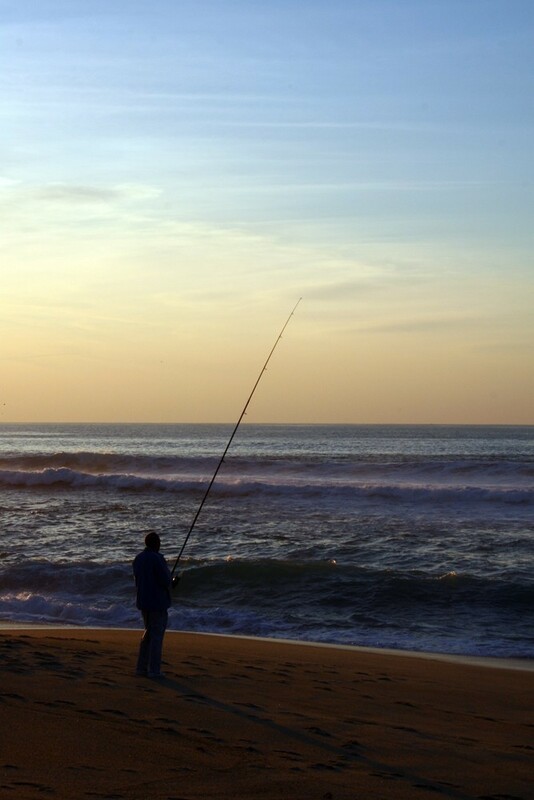 Very beautiful this loneliness of this fisherman in the sunset. Epic. Love the 'halo' where the edge of the sand meets the water. Wonderful shot indeed. Well done. One can feel with the fisherman being out of the hazzle of everyday, only by watching him :) Impressive shot! Superb composition. Great lighting and textures! Um momento de solidão a ver o pôr do Sol. Adoro como os pescadores descontraem. Muito cool. Very quiet. I like the fishing goal crossing the horizon line. Blue of the sea and orange of the sand works very well together. Wonderfully tranquil and sublimely beautiful scene. I love this. Beautiful composition, very nice light! This reminds me of fishing with my father. Nice shot! I love the sky. Nice picture. fantastic image .. the lighting is incredible. Fantastic capture of the setting sun. Superb colours. Una hermosura de fotografia, me encantan los colores , la luz y la composición. Saludos! Enquadramento cuidado e bem conseguido.